Back Row (L to R): Tony Mansfield, Jack Kiely, Jimmy O'Leary, Greg Fives, Pat Moore, Séamus Fitzgerald, Bobby Buckley. Front Row (L to R): Danny Lenihan, Matthew Hogan, Liam Enright, Bernard Shields, Tom Regan. 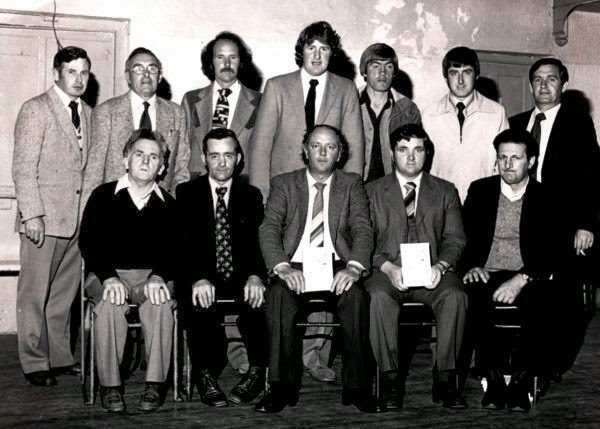 This week's photo shows committee members at the launch of the club's history book Dún na Mainistreach / Baile na Cúirte: The Growth and Development of a GAA Club at the Ocean View Hotel, Clonea in August 1980. Running to 303 pages, the book chronicled the earliest days of the club right up to the playing year of 1979. The book was priced at £3 with a print run of 2,000 and was the first of its kind by a GAA club in Waterford.